A sump pump is used in applications where excess rainwater or groundwater needs to be pumped away from a particular area. 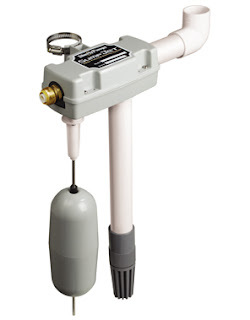 A sump pump sits inside a basin (also known as a sump) that collects this excess water. Automatic vs. manual operation — Selection of a manual sump pump means that one will turn the pump on and off when appropriate. Selecting an automatic sump pump means that a switch is wired to the sump pump to turn it on or off at appropriate water levels. Automatic switches include pressure switches, low level pressure switches and float switches. Power — Sump pump motive power will vary from 1/4 horsepower to multiple horsepower. Head pressure — The head pressure of a sump pump describes the maximum height that the pump will move water. For instance, a sump pump with a 15 ft maximum head (also called a shutoff head) will raise water up 15 ft before it completely loses flow. Technically, head pressure is defined as an expression of a pressure in terms of the height of fluid; P = yρg, where y is the fluid column height, ρ is fluid density and g is the acceleration of gravity. Other considerations may be added to overall head pressure, including loss from elbows/bends and friction loss from long horizontal runs. Power cord length — It is important to consider the length of the cord of any special switches that may be connected to the pump. Running a more powerful electrical motor a long distance from the main service panel will require heavier gauge wires to assure sufficient voltage at the motor for proper pump performance. 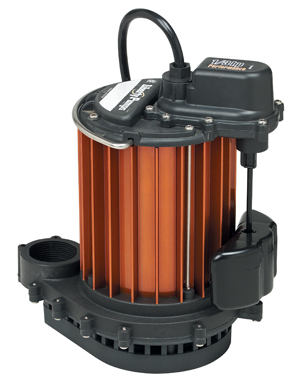 Phase and voltage — Sump pumps powered from the AC mains are available with single-phase three-phase motors. rated for 110-120, 220-240, or 460 volts. Three-phase power is typically not available in residential locations. Water level sensing switch type — Pressure switches are fully enclosed, usually inside the pump body, making them immune to obstructions or floating debris in the sump basin. Float switches, particularly the types attached to the end of a short length of flexible electrical cable, can get tangled or obstructed, especially if the pump is prone to movement in the basin due to torque effects when starting and stopping. Pressure switches are typically factory set and not adjustable, while float switches can be adjusted in place to set the high and low water levels in the sump basin. Backup system and alarm — If redundancy and an alert system are vital for operation of your sump pump, consider a backup system and/or alarm. It must be a marine deep cycle battery, or special long-life standby battery. Standard automobile batteries are not suitable for this application. Auto batteries are designed to deliver a high current for a short period. 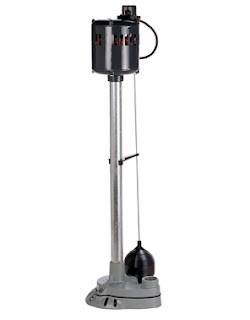 Sump pumps need a smaller current for a long time. A trickle-charge battery charger. May alternately have a specialized controller to manage, monitor and test that the battery holding a charge. Alternative sump pump systems can be driven by municipal water pressure. 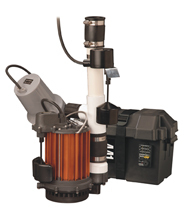 Water-powered sump pumps are similar to backup battery-driven systems with a separate pump, float and check valves. One can also use an ejector pump that uses an ordinary garden hose to supply high pressure water and another garden hose to carry the water away. Although such ejector pumps waste water and are relatively inefficient, they have the advantage of having no moving parts and offer the utmost in reliability. If the backup sump system is rarely used, a component failure may not be noticed, and the system may fail when needed. Some battery control units test the system periodically and alert on failed electrical components. A simple, battery-powered water alarm can be hung a short distance below the top of the sump to sound an alarm should the water level rise too high.